We www.24x7jobsearch.com are an emerging, dynamic, effective source empowering the Fresh Talent to the Corporate Industry. Our Campus to Corporate methodologies has proven to be beneficial and a unique platform designed exclusively for the hiring companies and job seekers as a common point of resource. Our organization envisions in making this event a win-win outcome for both aspirants and employers. We have conducted 40+ mega job fair events till date within less than a year. 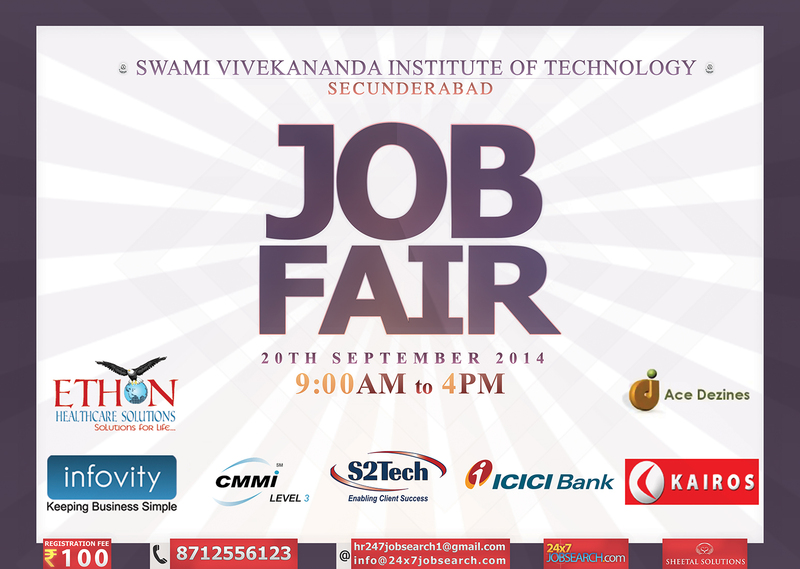 * We invite job seekers from all over the State and also to mention, across the Nation. * Invitations will be sent to 300+ colleges within the State, mostly targeting the “A” listed. * Branding will be done from all the key electronic and public sources of media. * Hiring companies get an opportunity to have live interview sessions with the aspirants. * Employers can gather an enormously huge Data Base for future requirements as well. Excellent HTML,CSS Photoshop Skills,Ajax Jquery.Eligibility: B.Tech,MCA,Msc Computers. For More Details can contact us on 8885933388,8885553017.